That composer Nils Vigeland and pianist Jenny Q Chai joined forces for this world première recording—a survey of work composed between 1973 and 2013, intriguingly heard in reverse chronological order—presupposed the success of the disc. From the very first note through to the earliest essay of the lot, their shared affinity for the art is readily apparent. Allora e Ora (Now and Then) most certainly lives up to its title. “Santa Fina” finds its saint-like colour with singular anchors, touches of dissonance and a feeling of brooding reverence. A trio of shrieks embodies the pain and suffering; Chai offers masterful weight at every turn. The wordless setting of “Accusi va ver monno” delights in old meets new with its fanciful flights and touches of mockery adding to the fun. Point/counterpoint finds artful expression in “Ricecrare” where the variety of textures and angularity beg for a choreographic treatment. Chai harnesses the raw power, steps back then grows again, more impassioned than ever. “I Turisti” is an amusing, populist diversion filled with an engaging array of touch and tone. With Five Pieces—written for the performer, Chai reveals as much of herself as the composer’s intentions; clearly they are both of like minds. The brief first movement is an introspective study, featuring scale snippets and hints of repose. 2. is wonderfully hesitato, letting mysteriously delicious chord progressions find their way to peace. The middle movement becomes a rhapsodic Q&A, where, even while in doubt, confidence rules. Chai has all of the answers and listeners may well get the impression that the music is talking to itself—aloud not imagined—before solitude reigns. 4. is a heady combination of assertiveness and extra-precious silence. Its sparse canvas, nonetheless, covers extreme ranges with multiple hues and dissonance that magically soothes more than it hurts. The finale is less certain, slipping in twinges of jazz, clearly searching “over the rainbow.” An upper register clarion call offers hope, prior to reaching ever closer to the goal as both artists expand the scope of the discussion, gaining strength and power in every succeeding measure. People portraits continue with Life Sketches (here in memory of former teacher Yvar Mikhashoff). “Wild Hopes” is definitely an apt title with tidbits of jazz amidst the high-flying ride; Chai’s left hand is clean as a whistle. A wonderful palette of colours and a touch of “Golliwog’s Cakewalk” imbue “Profane Dance,” replete with elements of stop and start: much like life itself. “Trumpets” readily delivers syncopated, edgy brass, tempered with moments of muted calmo. Unrelenting anger and powerful declamation fuel “Im Volkston,” while “Cambiata Waltz”—rife with moods—is definitely not for neophyte ballroom dancers. The concluding “Barcarolle” opens in the land of ethereal dreams, occasionally “interuptus” by stopped strings. Overflowing with deep, past-and-present reflection—thanks in large part to Chai’s impeccable phrasing—there’s enough material for any biography. 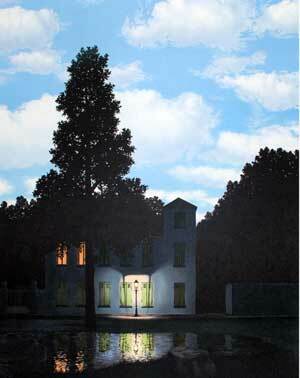 René Magritte’s L’empire des lumières is lovingly repainted on a musical canvas. Chai unravels the underpinning architecture with consummate skill.